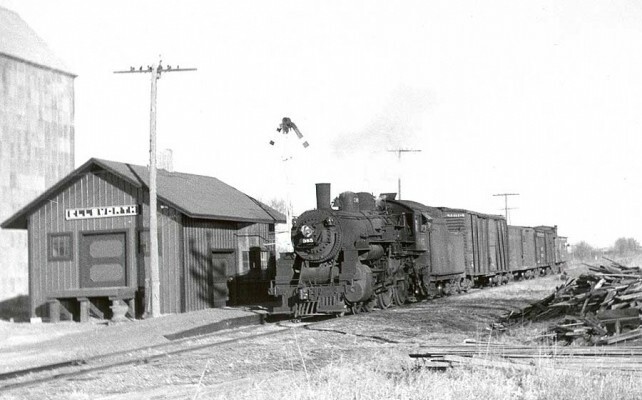 The Ellsworth depot was moved from Callanan when the Toledo and Northwestern Railway came through Ellsworth in 1880. The depot was a two story building with the agent and his family living on the second floor until 1950 when the depot was remodeled. Oscar Fossum was one of the first agents while Wilford Rash was the last agent, having served for 10 and one half years. 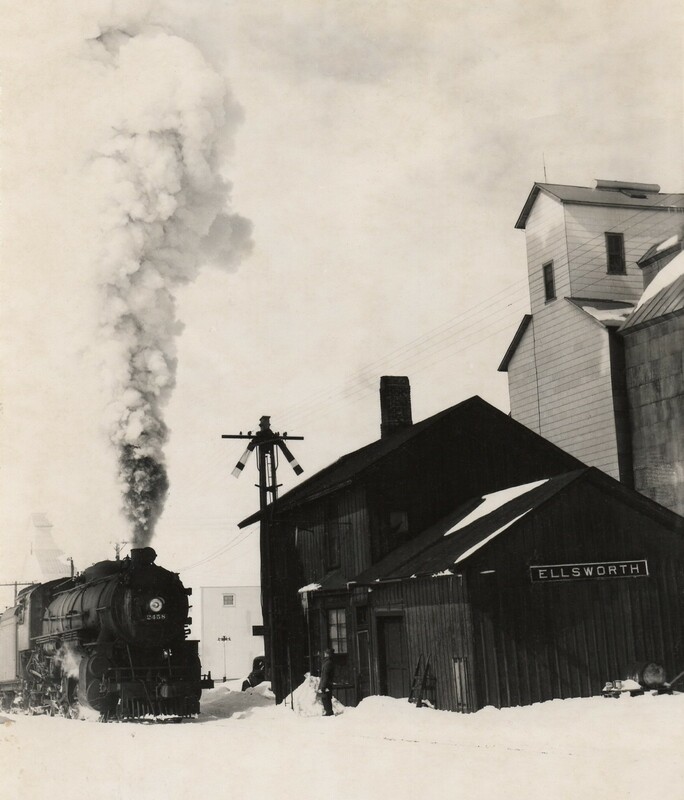 There were four passenger trains available during the twenty four hours with three mail deliveries each day. Several freight trains carried passenger cars as well. People would go down to the depot to meet their relatives and friends. Others would go down to visit. They enjoyed watching the trains coming in. One could hear the whistle from quite a distance. There were many long freight trains, too, which would move the farmers' grain, hogs and cattle. They would bring furniture, implements, groceries and other supplies for the stores. The last timetable listing scheduled for passenger service was dated June 27, 1954. The succeeding timetable dated September 26, 1954 listed only mixed train service and bus service. Freight trains still go through Ellsworth (This was true in 1980, when the Centennial Story was published), bring and pick up full freight cars; however, they are billed out of Jewell. 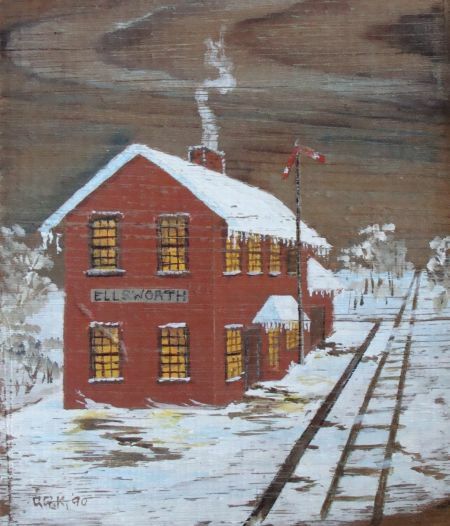 This painting of the Ellsworth depot (from the early days) was painted on a piece of wood by Genevieve Kuhfus in 1990. Board with painting is from the Freight Office." The Chiago & North Western paint gang was in town one day last week with a barrel of red paint and a spray gun, and when they got through, the depot was the color of a boiled lobster. It used to be slate color; now it's red. It is understood that in some localities (not on the North Western), in order to make an impression on the world's fair travelers, the depots are only painted on three sides &mdash; front and two ends, but I'll vouch for the fact that the depot here has paint on all four sides. Some of the women folks are inclined to think the color is a little loud, but gee whiz, who likes red paint better than the women folks? This photo from the 1940s shows a locomotive that has come from Jewell (from the west) parked at the two-story Callanan/Ellsworth depot a few years before the second story was removed. The second story was used as a home for the railroad agent and his family. 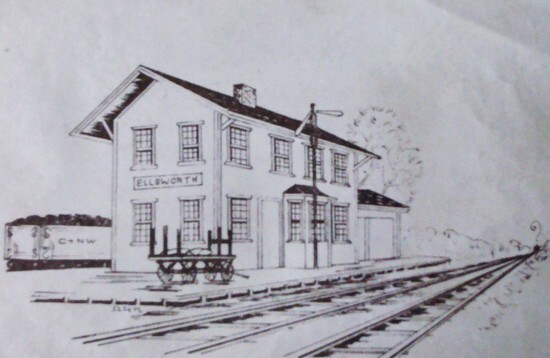 This drawing shows the two-story construction of the Callanan/Ellsworth depot before the second story was removed. The second story was used as living quarters for the stationmaster and his family. The Ellsworth Depot, built about 1877 or 1878 in the early settlement known as Callanan, was brought to Ellsworth three years later to become Ellsworth's railroad Depot. See images of other similarly aged depots in this area. Those images show more two-story depots (from the same time, about 1876 or so) in other nearby local communities. This 1930s image looks east. 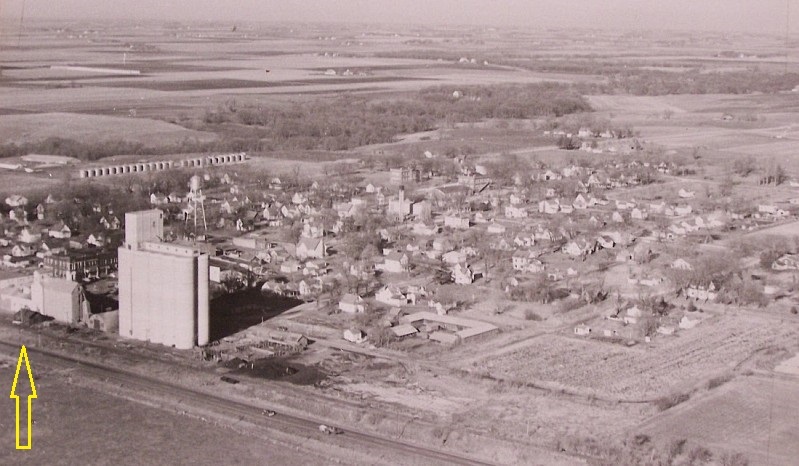 This aerial view of Ellsworth (perhaps from the mid-1950) looks northwest. 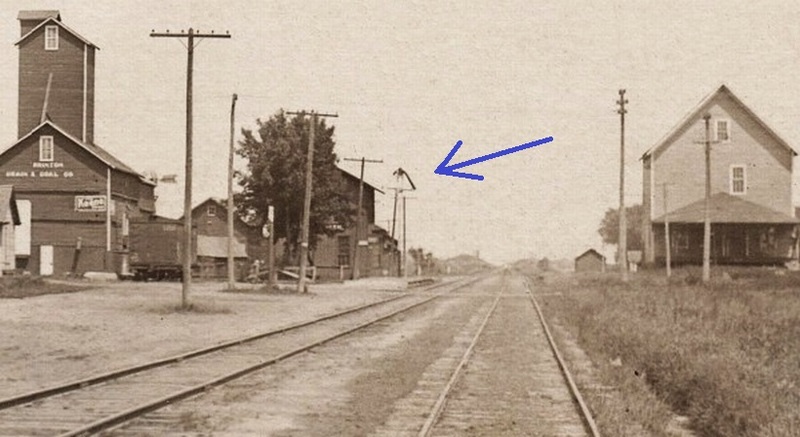 The railroad track and Iowa Highway 175 are both visible at the bottom of this image. 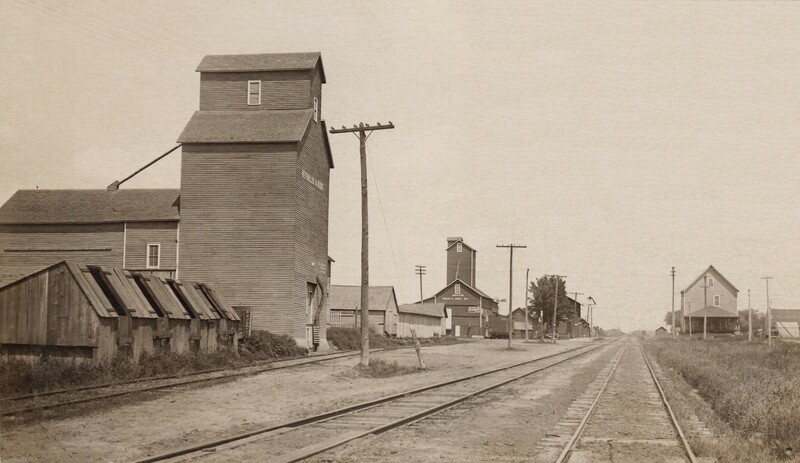 The Ellsworth depot can be seen at the extreme left front corner. The Ellsworth Depot, built about 1877 in the early settlement known as Callanan, was brought to Ellsworth (probably during the 1880 winter season) to become Ellsworth's railroad Depot. The depot was originally a two-story building with the station agent and his family living on the second floor until 1951, when the depot was remodeled and the second floor portion was removed. A crew of workmen started work Monday morning remodeling and modernizing the C. & N. W. Railway company depot in Ellsworth. The second story of the present two-story structure will be torn out and the roof lowered to fit over the first floor, converting the building into a modern one-story railroad depot. The freight room at the east of the depot will be removed, and the freight department will be changed to the west end of the depot. 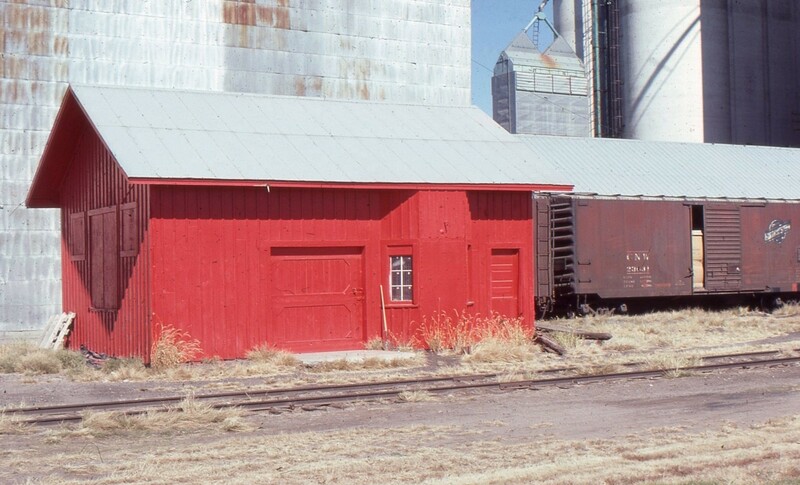 A wide door and a dock will be installed in this portion of the building to handle freight loading and unloading of the NorthWestern trucks, and for the convenience of the railroad's customers. Agent W. H. Rash's office will occupy the east portion of the modernized building. New cement foundations, cement floors, new siding, insulation, and a painting of the building in a neutral color will complete the attractiveness of the remodeled structure.